The dread of being stuck with an inconsiderate neighbor plagued me while I ran, as my mind rehearsed all the ways the problem could get worse and all the steps I might have to take to get it resolved. After all, there was only one good scenario: him moving out. But the bad ones seemed endless, and my mind seemed compelled to explore all of them, including having to move to get away from him. For me, his worst disruption of our previously serene little community in our building has been smoking (and stinking up my apartment!) although smokers are required to go off the property, not even in the courtyard, to light up. Worry clings to the mind in pursuit of a solution, even if there’s none possible at the time. Granted, this can be a preparation for coping, but I don’t go out in nature to worry, so I started counting the negative thoughts. Once I notice a pattern, it’s an effective way to interrupt it and make a particular worry into a practice rather than a torment. It came back eight times in four miles. With each return, I was no further along in solving the problem, but I was more aware of clinging to it and could let it go more quickly, to return to awareness of my movement and my surroundings. After all, if I can focus that intently on a negative, I apparently have the capacity to focus equally on something else if I chose to do so. 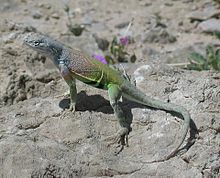 It was the day after a big rain, a cool eighty-two degrees, and that brought out the lizards. 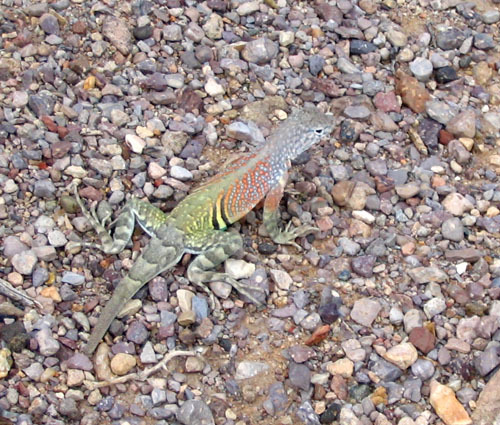 I saw eight greater earless lizards, evenly distributed along the trail, one about every half mile, and I paused to admire each of them. Their sleek gray heads and necks. Their glowing orange sides with diagonal black stripes. Their orange upper arms and radiant blue-green forearms. Their green hind legs and tail that seem lit from inside like a stained glass lamp. (The pictures don’t do justice to their true colors.) Most of them posed or did push-ups, as if showing off their jewel-like skins. Normally, I feel lucky to see just one, so this was an extraordinary bounty. When I got home, my landlord let me know he was giving the smoker a thirty-day notice to vacate the premises. I wish the guy would leave sooner, but the point is, I hadn’t needed to keep thinking about it. I’m glad I was able to pop the worry bubble often enough to enjoy the weather and the lizards.